Following the success of its inaugural edition, the 2nd Amman Opera Festival kicked off 4 September at the Roman Amphitheatre in Downtown Amman, Jordan. The festival focuses on two performanes of Giacomo Puccini's La Bohème (on 4 and 6 September) and a symposium to take place later this year. 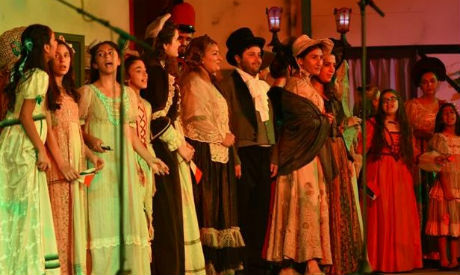 The soloists of the opera include the Jordanian soprano Zeina Barhoum (as Mimi), who is also the founder of the Amman Opera Festival; Max Jota as Rodolfo, alongside renowned singers from Georgia and Italy. They were accompanied by The Sichuan Philharmonic Orchestra, under the direction of the festival's artistic director and conductor, Lorenzo Tazzieri, along with choir singers from Jordan, including Jordan's children's choir Nai conducted by Diana Talhami. The opera is directed by Deyan Proshev from Macedonia. According to MAD Solutions, a company promoting Zeina Barhoum's activities, the opening night was attended by many public figures, including representatives from the Abdul Hameed Shoman Foundation (AHSF), the festival's cultural sponsor; Aqel Biltaji, former Mayor of Amman; Omar Al-Louzi, city manager at the Greater Amman Municipality (GAM); in addition to ambassadors of Lebanon, Panama, France and Italy. The first performance also witnessed the attendance of Kifah Fakhoury, former director of the National Music Conservatory; Farouk Qasrawi, personal advisor of His Majesty King Abdullah II; in addition to Jordanian businessmen Wasef Jabsheh and Mazen Dajani, as well as Fouad Bajjali, chairman of National Express; Hashem Abu Samra, executive manager of AVIS Jordan; and Duke Mamdouh Bisharat. The festival also plans to launch in schools in Jordan and abroad. The results of these activities will be announced during the symposium whose date is yet to be announced. The Amman Opera Festival takes place at the 2nd century Roman Amphitheatre, a famous Jordanian landmark, accommodating 6,000 audience members.